Ethan is settling in quite nicely to life in our crazy household. He is getting stronger every day and happier as well. He is a real love bug. He just eats up our attention and is such a loving little boy. He is quite challenging as well. He still is not eating anything much other than receiving his three bottles daily supplemented with cereal and Pediasure in the mixture. We have tried just about everything to entice him to eat and no go. We will be seeing a Sensory Integration Therapist this week for this problem and he has also qualified for the Early Steps program in our area. Due to his difficult start in life and his feeding issues and failure to thrive he is eligible for in home services with an infant and toddler development specialist as well as a speech therapist. They are rushing us through the system due the urgent nature of his feeding issues. I am proud to report that even with his poor eating that we have been able to put a half of pound on weight on his little body. The people that assessed Ethan felt that his issues were due to under stimulation and neglect and that he would improve very quickly with this type of assistance. Ethan loves our Chihuahua, Gabby and just as Katie was, is always in hot pursuit of her. Hopefully he will not kill her with kindness. That brings us to the next subject with is the relationship between the dynamic duo also known as the gruesome twosome depending on the minute of the day that we are parenting them. The already love each other a great deal and at the same time are in fierce competition for everything and anything from one of us to any material item that the other one is even looking at. The green eyes monster has Katie acting in ways that she did not before Ethan. This is Very understandable as her world was rocked and she is sharing time and attention that was all hers before. We are very gratified to get this news from the Doctor and now we can focus our energies on Ethan’s eating issues and of course working on bringing him up to his chronological age developmentally. 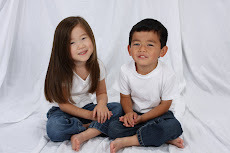 Here are a few cute pics of our kiddos. I will post a few more in a couple of days. I also plan on redesigning the blog in a few days to reflect the changes in our family. I have posted our final post on the travel journal on www.ethansjourneyhome.com so please visit and leave a comment for Ethan. After about a month I will be shutting that site down. I will continue to post on this blog.